We’d love your help. Let us know what’s wrong with this preview of The Faithful Gardener by Clarissa Pinkola Estés. Clarissa Pinkola Estés, Ph.D., the internationally known poet, psychoanalyst, and author of the seminal classic Women Who Run With The Wolves (99 weeks on the New York Times bestseller list, translated into eighteen languages, and a bestseller worldwide), touches our lives anew, rendering in the strong and lyrical voice for which she has become known a powerful series of h Clarissa Pinkola Estés, Ph.D., the internationally known poet, psychoanalyst, and author of the seminal classic Women Who Run With The Wolves (99 weeks on the New York Times bestseller list, translated into eighteen languages, and a bestseller worldwide), touches our lives anew, rendering in the strong and lyrical voice for which she has become known a powerful series of her signature healing stories. These elegantly interlocked tales of loss, survival, and fierce rebirth center around Dr. Estes's uncle, a war-ravaged Hungarian peasant farmer and refugee, a faithful gardener, and a storehouse of stories who was one of the "dancing fools, wise old crows, grumpy sages, and 'almost saints' who made up the old people" in Estés's childhood. To ask other readers questions about The Faithful Gardener, please sign up. Life is full of invitations to feel hopeless, especially in the face of real darkness and suffering. This book is a powerful tonic against despair. I keep it in the medicine cabinet. This book can easily be read in one sitting and it'll touch your heart and soul and make you smile and cry. Excellent. Magical, hypnotic story weaving as only Estes can. New seed is faithful, it comes on the wind whether you want it or not and it roots in the places that are the most empty. Stories came into the world because God was lonely. After sobbing my heart out, I ended up staring at the wall with tears still running down my face, having so many thoughts, remembering my childhood, my 'uncle', my stories, the stories of those I love, their changes and their empty fields. A wise tale indeed. Short but unforgettable and very powerful, one I'd like my child to know as soon as he's old enough to understand. Thank you, Sofia, for uncovering such a jewel and bringing it to my attention. A little light in the dark. Short but powerful. Hopeful and deeply moving. I will keep it close to me. reading clarissa pinkola estés is an opportunity to sit at the feet of a master storyweaver and teacher of the art of living, honestly. this one is no exception. here there is a tale about the alchemy that transforms trauma through storytelling through families, cycles of creation, the value of fallow fields and the way that to see and touch constant death/change is the way to know that which can never die. Lovely, beautiful story...everyone read this. The language in this book is fantastic. The descriptive metaphors create a mental picture and a mood. "Squeezed together like canned plums in a pint-sized glass jar, we rode the interminably hot train all the way to Chicago." The time is shortly after the close of World War II. The place is in the United States where refugees from German camps are trying to learn to live again. "What does it mean to live with a war and memories of war inside oneself? It means one lives in two worlds. One looking fo The language in this book is fantastic. The descriptive metaphors create a mental picture and a mood. "What does it mean to live with a war and memories of war inside oneself? It means one lives in two worlds. One looking for hope, the other feeling hopeless. One looking for meaning, the other convinced that the only meaning in life is that there is no meaning in life." The book is short, barely 75 pages. It is one I want to keep on my shelf yet one I hesitate to ever read again. This is because it is so intense and creates such a strong emotional response. There is no gore, no real description of what Uncle Zohar saw in his labor camp. Only the aftermath is there as he tries to face the past and build a future. The author is a cantadora, a keeper of stories and a teller of stories. Her expertise is very evident. The Faithful Gardener is one of the most powerful books you can read in one sitting. Estés weaves stories around her uncle Zovar, a war-torn refugee and lover of gardening and storytelling. It's a hopeful, heartbreaking, beautiful book. I don't know how many of my lives, past, present, or future, that this book acted as a balm for, but reading it was quite a profound experience that left me feeling kinder toward my own war-weary heart. This is a nice little hopeful book about stories - stories about a man, a tree, and that which will never die. An absolutely beautiful book! Full of beauty, pathos and wisdom. Amazing experience. The book is simple and simply magical. Easy to read for any person who reads with the heart open. I came across this delightful little book among my husband’s ‘stuff’ while unpacking recently. The timing seems pertinent, in a world rife with turmoil and unrest. 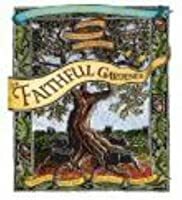 The Faithful Gardener, by Clarissa Pinkola Estes, is a slim, yet impactful book that can be read in one sitting, yet reflected upon for days. Clarissa’s Uncle Zovar was a Hungarian peasant farmer and refugee, who survived Nazi slave camps and eventually emigrated to America. With a gift of storytelling and a sacred connection to the Ea I came across this delightful little book among my husband’s ‘stuff’ while unpacking recently. The timing seems pertinent, in a world rife with turmoil and unrest. The Faithful Gardener, by Clarissa Pinkola Estes, is a slim, yet impactful book that can be read in one sitting, yet reflected upon for days. Clarissa’s Uncle Zovar was a Hungarian peasant farmer and refugee, who survived Nazi slave camps and eventually emigrated to America. With a gift of storytelling and a sacred connection to the Earth, her uncle fills her childhood with stories that later inspire this little gem. Honoring the oral traditions of her culture, it is presented as a series of interlocking tales that speak to loss, survival and rebirth. Stories that are shaped by the hopelessness and the ravages of war, yet give rise to incredible courage, strength and the force within us all to rise above and renew ourselves. If allowed, I would rate this book as a 10/5. Beautiful. The tales are inspirational and encourage strength and the sage advice to embrace inevitable change with positivity. Tyrannical adversity and tragedy are conquered with the power of having the ability to control ones response, reaction and inner perception of not only that very moment but that change, if inevitable, can have a positive outcome even if only in one's perception. The author grew up in a home filled with refugees from World War If allowed, I would rate this book as a 10/5. This book (while extremely short) was a DNF (did not finish). It has a great message to it, especially tying in the story of the author's WWII horrors with stories of gardening. I actually wanted to like it, and skimmed for the parts about her uncle. Those were fascinating. But the writing was horrible.... Have you ever heard a hippie speak? That traditional "love the trees, god is good. I don't like complete sentences but live in another world cause i'm high outta my mind". Well that's the voic This book (while extremely short) was a DNF (did not finish). That which can never die is an ever changing and evolving forest inside all of us. Even when all seems to be in ruins from a fire, barren land and ash soon invites new life to grow. Trustworthy seeds that had been waiting root from the ashes of the old and new life is born. This is true in nature, it is also true in the human condition and how life goes on. Wonderful audiobook told in the voice of Clarissa Pinkola Estes, an incredible story teller, philosopher, and psychoanalyst. Un libro que leí por azar hace doce años en una casa en la que estaba de visita y no había más libros. Recuerdo que me gustó mucho la imagen del jardin al que se le prende fuego y que con los años se vuelve algo salvaje e impredecible. No tengo mayor juicio de este libro, no recuerdo más, pero esa fue una imagen poderosa, y perdurable, para mí. This book was a beautiful 1 hour read with a big and powerful message. Living and dying and how both serve purpose and in essence are just as beautiful and purposeful as each other. This book echoed the beautiful memories I have of my own mum reading us kids her favourite story 'The Giving Tree' When we were young. I loved this story so very much! Meh. Self-conscious, at times clumsy, underdone, and ultimately underwhelming. I'm sad because I expected a tiny gem of treasure and got what seems to have been a stop-gap. There were moments of brilliance but sadly, a potentially wonderful premise has been allowed to slip by without being fully developed. What a delightful little book! It's a quick read, but don't expect much. It's really just a 60-page family story. I loved the title fable, reminded me of a Hans Christian Andersen story, The Fir Tree, only with a happier ending. This is a deeply profound and moving story about beauty rising out of the ashes. I absolutely loved the depth of truth and wisdom. It is a beautifully written and thought provoking book. It can be easily read in one sitting, but I will be thinking about it long after. I highly recommend it! Easy to read in one sitting. Good inspiration to never give up, and to roll with the changes that life brings your way.